Waterborne conducts field studies—small and large. From a fraction of an acre research plots to nation-wide monitoring programs, we consider ourselves to be experts in the soil, water and agricultural sciences. 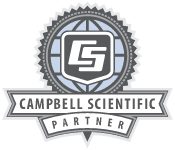 Using our cultivated skills, we develop and execute monitoring programs using Campbell equipment that meet study data objectives. We excel in custom system design using equipment from well-known and trusted manufacturers (such as Campbell Scientific) and making modifications to provide the desired measurements in the required locations.